Let's get the negatives out of the way first. It usually doesn't bode very well in terms of organization when a convention is still announcing guests for the con with less than two weeks to go. Fortunately it doesn't seem like the con was a gobbled mess, although there were some delays here and there. It is frustrating for conventions to announce their guests so late and so close to the start of the con. It can't be good for the con in terms of attracting new attendees as most people will have already decided on whether or not they want to attend. It also prevents cosplayers from being able to finalize their costume lineups as a lot of times cosplayers will bring their costumes to match the series that their favorite guest is a part of. It also didn't help that AnimeNEXT published their schedule to the Guidebook App and then didn't actually tell anyone that it was up. Another issue was that the two doorways to the Dealers Room and Artist Alley were apparently changed on Saturday to being Entrance-only (instead of being Entrance and Exit) which forced all of the attendees to exit the Dealers room via the adjoining video game room which seems like a very odd decision. Also, while I didn't attempt to get any autographs I did see a lot of comments online about the lines being handled very poorly. And finally, while people seem to think that the Jitney shuttle bus situation was not as bad as last year, it does seem to still be a big problem with the shuttle buses only seemingly going to the stops that had a lot of people while ignoring others. So what about the good stuff that happened this year? 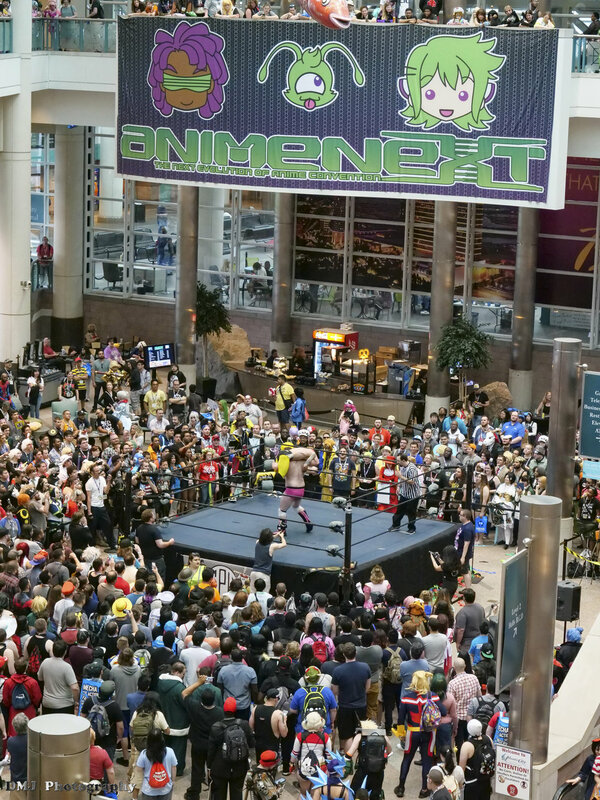 For starters, Cosplay Pro Wrestling returned for its second year and it was just as popular as ever with people lining the balconies to get a glimpse of the spectacle. I do kind of hope that next year (assuming that they return for a third year) that AnimeNEXT will put them in the Main Events hall (instead of the Atrium lobby) so that more people can watch the event instead of forcing people to crowd around all of the upper level railings to try to get a peak at the action. I also appreciate the fact that AnimeNEXT is joining a lot of other conventions in officially coordinating the cosplay photoshoot gatherings. Having the convention schedule and publicize the photoshoot gathering timeslots is a much better way to organize the shoots vs someone trying to organize it unofficially on a forum (or having no coordination at all and making it harder for attendees to know what photoshoots are happening at the con). However, AnimeNEXT does need to improve next year by actually including the location maps for the shoots in the Guidebook app so that people can actually know where to go for the photoshoots. Plus, the photoshoot locations definitely need some kind of signage posted at the spots to help people identify the locations. The Masquerade contest this year was excellent as usual. I really liked the half-time performance put on by the AnimeNEXT masquerade department by enacting a comical skit of the movie Jurassic Park. I enjoyed going to voice actor Johnny Yong Bosch and Bryce Papenbrooks' individual Q&A panels. I do wish though that AnimeNEXT would consider doing a general Voice Actor panel which includes all of the voice actor guests in one large Q&A panel. Most of the other conventions do usually schedule a panel like that which is great if you can't find the time to be able to hit up each voice actor guest's individual panels. Having a large voice actor panel allows you to see all of the voice actor guests that you might miss otherwise. Oh, and apparently the fire nation attacked the con on Friday night as the convention suffered a fire alarm event for about half an hour (apparently one of the DJ's smoke machines set off the alarm). Overall, the convention was still a lot of fun despite its hiccups that will hopefully get addressed in future years. Click here to visit my Facebook Photography page where I uploaded my photos from the Persona, Fate Series, and Fate/Cheerleaders cosplay photoshoots. Click here to go to my YouTube channel where I uploaded the videos that I recorded of Johnny Yong Bosch's Q&A panel, Bryce Papenbrook's Q&A panel, and the complete cosplay Masquerade contest.